While everything seems to be going digital, there is no replacement for a marketing piece that lands in the consumer's hands. In fact, more than half of all travelers still use some form of printed material while planning their trips. Crave Montco is the official dining magazine of Montgomery County, Pa., and includes feature articles, top 10 lists and listings for area restaurants. The magazine is printed twice yearly with more than 10,000 copies in each run. Crave can be found in area hotels, at the #MakeItMontco traveling kiosk, at member restaurants and at the Visitor Center at Valley Forge Park. Crave is also used as part of our hotel welcome bags and can be ordered at CraveMontco.com. The quarterly Montco Explorer Newspaper is the source for the latest news and updates for Montco's tourism industry. Geared toward daytrippers in Montgomery County and Greater Philadelphia, the newspaper includes information on area attractions, hotels, restaurants and events, as well as the latest from the Valley Forge Tourism & Convention Board. Readers can pick up your copy at the #MakeItMontco kiosk, view it digitally on ValleyForge.org or find it at local coffee shops, doctors offices and other businesses. Destination Montco Golf's official golf guide for Montgomery County, Pa., is the ultimate resource for golfers. The annual publication highlights the county's more than 50 golf courses, as well as nearby hotels. The guide is distributed through a partnership with Sports Illustrated's GOLF Magzine, reaching subscribers across the country. Our publications are just another way of getting our members in front of travelers and locals who are looking for things to do, restaurants, shopping, hotels, meeting space and services. Every member of the Valley Forge Tourism & Convention Board receives a listing in our official Visitors Guide. Restaurant members also receive a listing in Crave Montco. 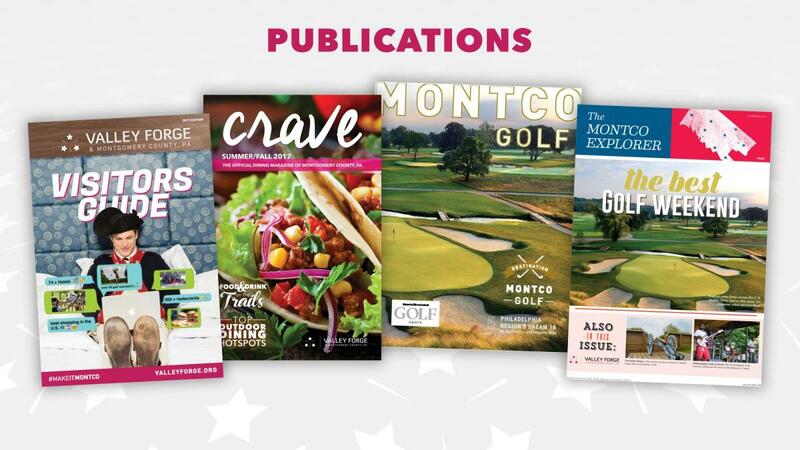 Golf course members receive preferred placement in the Montco Golf Guide. Hotels also receive an additional listing in the Montco Golf Guide. And every member has an opportunity to appear in the Montco Explorer newspaper. All you have to do is keep us in the know about what's new and upcoming - renovations, expansions and new services are all great story topics - and we will do our best to add you to our editorial calendar.